The Surf The Wave dual lane is the ultimate in slip and dip cool! 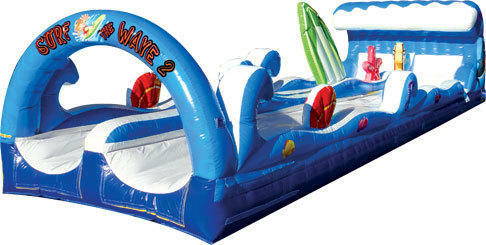 35 Feet Long with two lanes, So you can have double the fun! This slip and dip is a great fit for any beach, tropical, or surfing theme party! This one will definitely impress your guest! Rent Surf the Wave Today!